Building gingerbread houses can be a frustrating process. An idyllic three-story building with crystal sugar snow, marshmallow snowmen, and gumdrop twinkle lights can quickly end in a collapsed mess, sending icing windows and candy cane gates into disarray. But don’t resort to those trusty milk cartons and graham crackers just yet – with a few changes in technique, your dream house can easily be obtained. During our recent “Engineering the Perfect Gingerbread House” event, graduate student Kendra Nyberg taught UCLA students about the best practices for gingerbread construction. Her lecture delved into the molecular makeup of the materials and the physics behind the structure. Gingerbread should be sturdy and demonstrate elasticity, which is the measure of its ability to resist deformation . Because the gingerbread walls will be under stress from the roof, there needs to be sufficient resistance to avoid cracking or total collapse. Dough with a tough, springy consistency and decreased moisture content is ideal, and can be achieved by using flour with high protein content, such as bread flour. 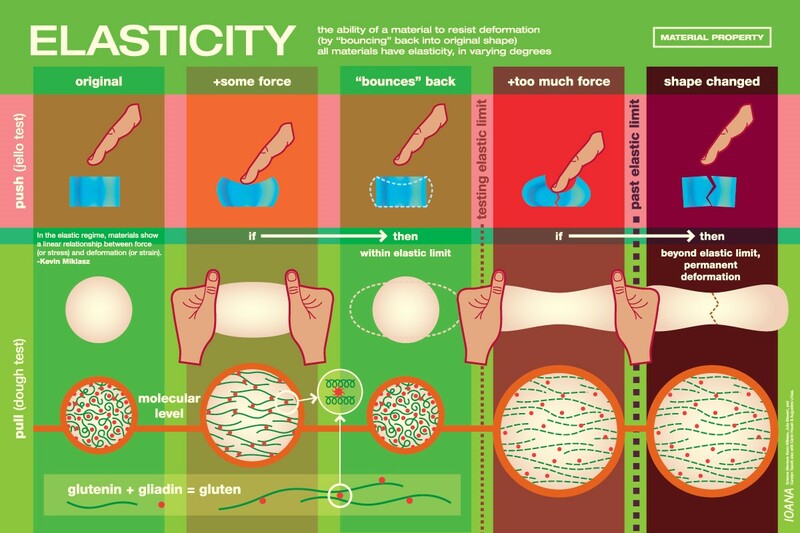 Higher-protein flours contain more glutenin and gliadin proteins, which create the springy gluten network that gives dough its elastic properties. Icing serves as the glue that holds the entire structure together. The mixture should be just pliable enough to hold the gingerbread pieces together before drying into a hard, unmovable substance. Here egg whites are key. When beaten, the egg’s proteins denature and then coagulate, stabilizing air bubbles in the icing and creating white, foamy “peaks” that vary in their stiffness and resistance to gravity. Stiffer peaks are better for gingerbread icing, and more coagulated proteins can contribute to a stronger paste. Why use icing instead of frosting? Both confections contain copious amounts of sugar, but where icing contains egg whites, frosting typically incorporates butter. The additional fat globules from butter provide some thickness and stability to the frosting. However, since standard buttercream frosting does not contain egg whites, the only proteins present are those from the milk in the form of butter. Although these proteins are perfect for dense and creamy cupcake topping, they do not assemble into the stiff, strong networks needed for gingerbread house construction. Once the bricks and mortar of your gingerbread house have been created, you can move onto the creative part of the process – construction. There are many forces acting on a gingerbread house. 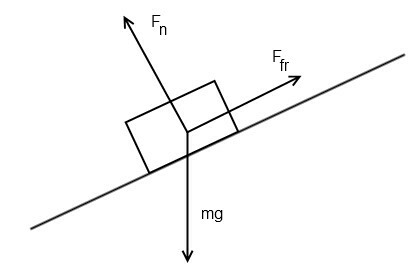 Consider the roof: forces on the sloping gingerbread roof includes friction from the frosting, a normal force perpendicular to the gingerbread surface, and gravity pulling the roof toward the floor. These forces also show up to varying degrees in all of the upright walls of the gingerbread house. To avoid collapse, it is best to spread out the forces over many surfaces. For example, a wider structure with a flatter rooftop will be sturdier than a narrow house with a sloping roof. If the height of the house is very high, the gingerbread is also more sensitive to buckling under the added weight of the extra gingerbread. 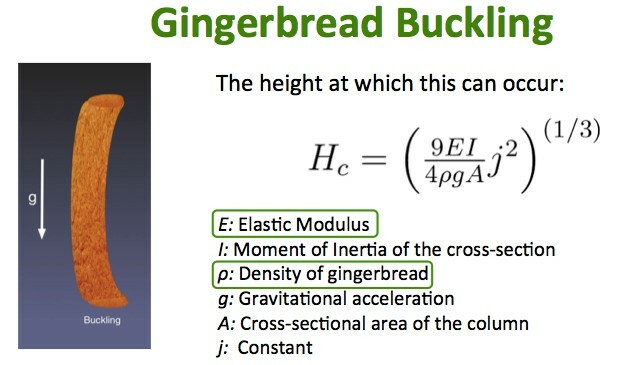 To prevent buckling, you can calculate the critical height at which buckling occurs, which depends on such factors as gingerbread density and the force of gravity . You don’t have to be an engineer or an architect to construct the perfect gingerbread house. With the proper dough, frosting, and design considerations, the house of your dreams can be achieved – perfect to last as a display through the holidays. Now get building! 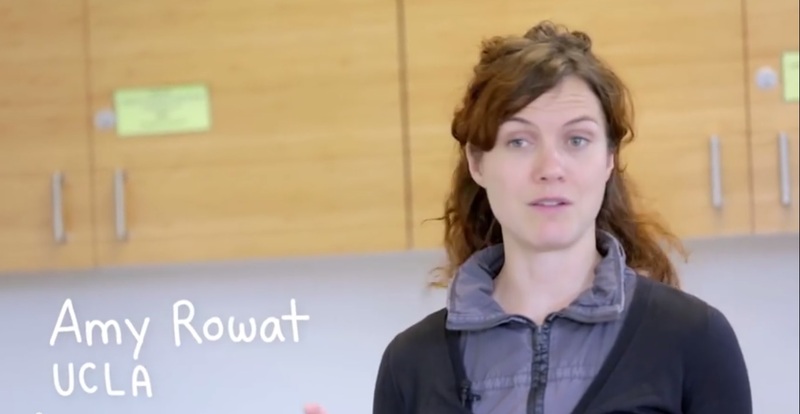 Our very own Amy Rowat explains how to use science to bake a better pie, and geneticists look at the DNA of cacao beans to breed better chocolate beans. For the health-conscious members of society, there are several food fiats: thou shalt avoid high fructose corn syrup, steer clear of ingredients that sound like they could be found in jet fuel, and fear partially hydrogenated oils. Oil in and of itself is not inherently bad; how does adding hydrogen to transform it into the bane of all processed foods? The general term “hydrogenation” refers to the “reaction of hydrogen with an organic compound.” The term organic compound refers to any molecular compound that contains carbon atoms. The process used to modify oils is technically known as “catalytic hydrogenation,” since it takes place in the presence of a catalyst, which helps speed up the reaction. Hydrogenation is typically used to improve the flavor stability and keeping qualities of oil. An unhydrogenated oil can turn rancid because its unsaturated carbon atoms are free to bond to oxygen atoms from the air, forming peroxides, which give rancid fats their “off” flavor. Sometimes oils, particularly vegetable oils, are only partially hydrogenated. 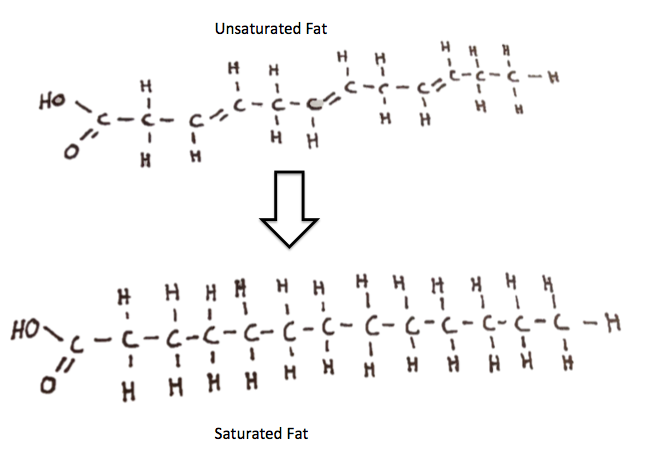 Complete hydrogenation creates a product containing only saturated fats, which typically has a solid and waxy consistency that is not appropriate for cooking, baking, or eating. 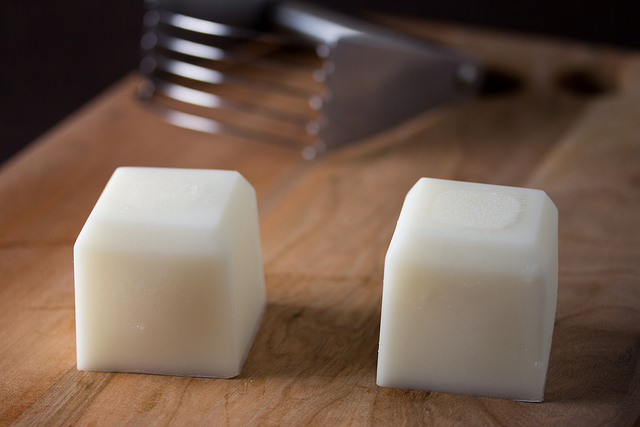 Fully hydrogenated vegetable oils would resemble candle wax and have a melting point above 60°C . So how is oil hydrogenated? Typically, a mixture of refined oil and finely powdered nickel (the catalyst) is pumped into a large capacity cylindrical pressure reactor. Heating coils heat the oil to 120-188°C (248-370°F) at 1-6 atmospheres pressure . Hydrogen gas is pumped into the bottom of the reactor, and everything is continuously stirred to distribute the rising gas bubbles throughout the liquid oil. The high temperature, pressure, and the presence of the catalyst ensure that any carbons in the oil that are not at their full hydrogen bond capacity (the “unsaturated” carbons), form new chemical bonds with the hydrogen atoms, thus becoming more and more “saturated” with hydrogen. As they become fully hydrogenated, the oil molecules begin to straighten out and stick to one another, causing the liquid oil to solidify . But hydrogenation is not restricted to humans with access to pressure vats. Microorganisms that live in the rumen of cows and other ruminants can “biohydrogenate” fats without any fancy pressure vats or catalysts . Scientists who study fats have long known that fats in the tissues of ruminants are more saturated than those of nonruminants . 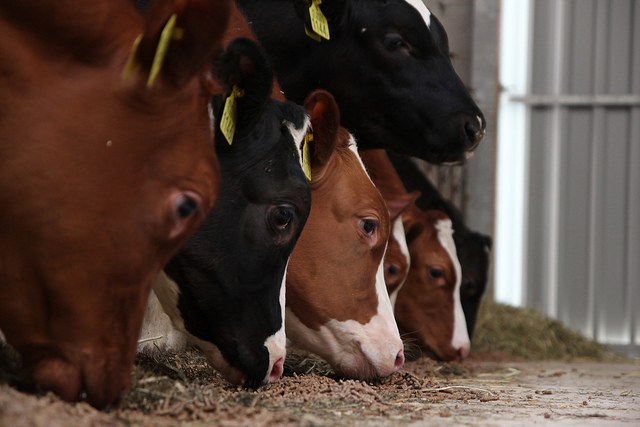 Grass and other typical ruminant feedstuffs are rich in unsaturated fatty acids, yet these fats are only present at low concentrations in meat and milk. When food enters the rumen (essentially a large fermentation vat intended to break down the animal’s fibrous meals), gut microbes catalyze a range of chemical transformations. For example, ruminal microbes transform lipids through both lipolysis and biohydrogenation. Through lypolysis, microbes break the bonds of long fat molecules, thus producing simpler fatty acids. Unsaturated fatty acids are also biohydrogenized, a process very similar to industrial hydrogenation, but catalyzed by microbes instead of metal . Because of this biohydrogenation, dairy products typically contain 5-10% trans fatty acids , which are consumed by anyone who drinks milk or eats butter, tallow, or beef. 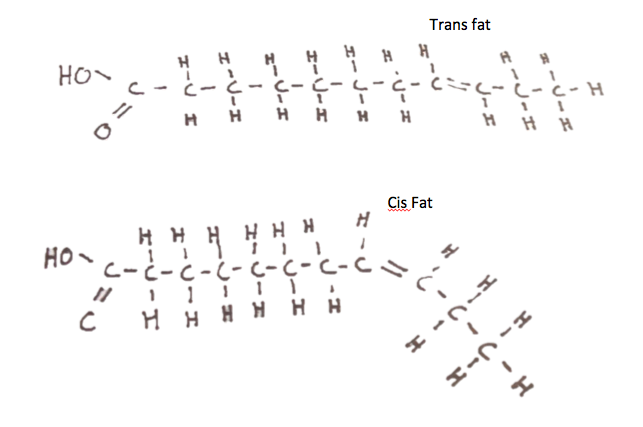 It is important to note, however, that the predominant trans fatty acid in ruminant fat (vaccenic acid) is not the same as the predominant trans fatty acid produced by hydrogenation of vegetable oil . High consumption of trans fats from industrial hydrogenation are well documented as being linked to cardiovascular disease, while clinical and rodent studies of vaccenic acid have not documented such a strong correlation. These ruminant fats may even protect our hearts from these diseases, but further research is necessary. Caramel flavor is a major component of desserts and candies, ranging from smooth, thick sauces to crispy, dark brown glazes of crème brûlées. 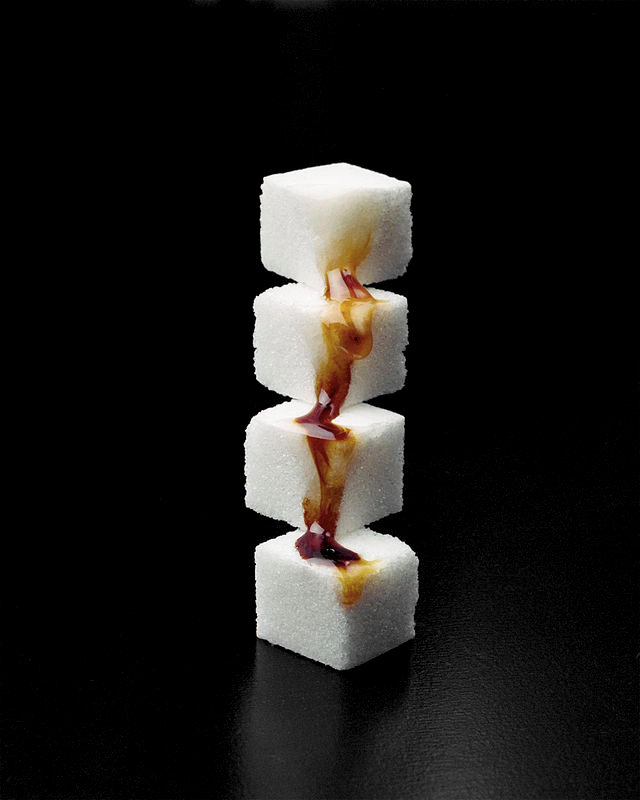 Through caramelization, a browning process where sugar is heated to around 170 °C and broken down, over 100 compounds are formed that contribute to the color, flavors, and textures of what we know as caramel . One simple way to caramelize table sugar is by heating: this process removes water from the disaccharide sucrose (a substance composed of two simple sugars) and breaks it down into monosaccharides fructose and glucose. Next, the monosaccharides react with each other to form new compounds, such as caramelan, caramelen, and caramelin . These compounds aggregate to form brown particles of various sizes due to additional water elimination, contributing to the characteristic brown color of caramel. The stickiness of caramel can be attributed to the ring form of these molecules combined with the presence of free radicals . Further, when in the presence of alkali, sulphite, or ammonia, these compounds can also result in colorants used in food products such as soy sauce and Coca-Cola . In addition to these classic caramel compounds, many other molecules are produced that result in different aromas that contribute to caramel’s complex flavor profile, such as furans (nutty), diacetyl (buttery), maltol (toasty), and ethyl acetate (fruity) . How to tune the flavor of your caramel? The temperature the sugar is heated to determines caramel flavor. “Light caramel” (180°C) can be used for glazes, is rich in flavor, and pale amber to golden-brown in color. By contrast, “dark caramel” (188-204°C) is dark and bitter in flavor due to increased oxidation of the sucrose molecules; it is usually used for coloring. Additional heating past this point will turn the caramel into a black and bitter mess, as the sugar breaks down into pure carbon . Interestingly, caramel candies made with milk or butter do not undergo the caramelization process. Instead, the heating of the dairy product in the recipe causes Maillard reactions between sugar and amines that result in the brown color and flavors produced . Next time you enjoy caramel flavor, you can revel in the smell and taste of all the aromas that result from complex chemical processes. Or, simply make your own with sugar, water, and a stove. “Caramelization.” Accessed 21 October 2014. “The Chemistry of Caramel.” ScienceGeist. Accessed 21 October 2014. “E150 Caramel.” Accessed 21 October 2014. At UCLA, researchers reveal another benefit of yogurt: probiotics found in yogurt can help improve brain function. Learn more about the world that probiotics occupy in a podcast about the “messy mystery in the middle of us” over at Radiolab. 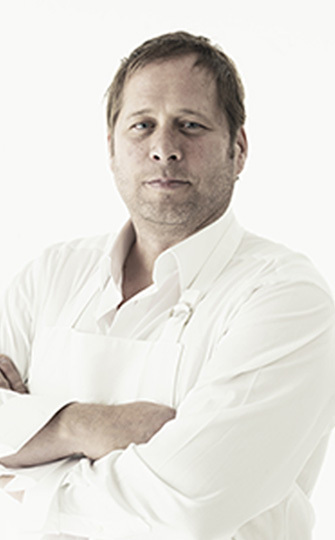 David Kinch is Chef-Proprietor of Manresa, a restaurant located in Los Gatos, California that has been awarded two Michelin stars for eight consecutive years. Kinch is a winner of the Best Chef in America award from the James Beard Foundation as well as dean of The International Culinary Center. Having studied the culinary arts in France, Spain, German, Japan, and the U.S., he is known for his French, Catalan, and Japanese-influenced California cuisine that has been lauded as simplistic yet creative. I became enamored with the restaurant business which led to being enamored with cooking. My first restaurant jobs were as dishwasher and front of house staff. In those roles, I got close to the kitchen and became fascinated with how the cooks worked. After that, I became interested in the idea of being creative and working with my hands. It was really inspiring to watch people enjoying the fruits of their labor through cooking. Ice cream because it keeps things frozen on a hot day! I find Japanese food fascinating because of the complex simplicity of it. One of my favorite examples is making chicharones by first cooking them sous vide so the collagen (and flavor!) don’t leach out into the water, creating a whole new, interesting and satisfying texture. Cake tester – I use it for testing the doneness of meat, fish, and vegetables. My favorite ingredient changes all the time. I can be a farm chicken to fennel bulb to an herb. Good coffee and usually yogurt and honey. If I’m splurging, it is toast with Manresa’s butter, and Chez Pim jam. If I’m going out, it’s always huevos rancheros.